Yogurt is a great thing. It’s one of those treats that you can have for a sane amount of calories, it’s sweet (many even come in dessert-inspired flavors), and because yogurt is full of calcium and protein, it’s good for ya. These reasons are precisely why I eat yogurt darn near everyday. Usually, it’s the last course of my lunch meal (the first being raw veggies and the second being a cup of soup or a sammy), or it’s dessert in the evening when my sweet tooth is a-talkin’ to me and I need to talk back. However, similar to the nutritional bar aisle, the refrigerated yogurt case at the grocery store is crazy-packed, and the varieties are endless. But we’re here to help you sort that section out. I recently loaded up my shopping cart with five healthy and lower-cal varieties for an official FBG taste test. Below are my results. So, bust out your grocery list and prepare to add a few must-haves to it! The name of this yogurt couldn’t be cuter, and its nutritionals are definitely to be noted, as each 6 oz. container has 15-17 grams of whey protein with about 145 calories. The Peach Mango and Acai Mixed Berry flavors are good and natural tasting (read: not overly sweet, which I prefer), and the plain variety is good with a little honey or cereal. I will warn you though: the yogurt isn’t overly creamy and was a bit runny for my taste. The extra protein may be worth that though. Erin’s husband and one of my good friends swear by this yogurt in helping their systems get, er, regularly movin’. I sampled the Blueberry flavor and enjoyed its taste, but the portion seemed terribly small. Sure, it’s only 70 calories, but it’s also only 4 oz. The 3 grams of fiber and 5 grams of protein in each serving helped, but, honestly, I’d rather up the cal count and have a couple more bites. 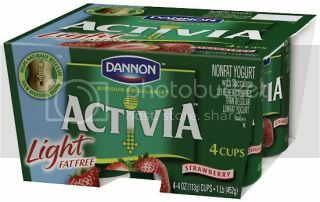 One thing is for sure though, Activia’s prized ingredient “bifidus regularis” sure is tasty! I am in love with these. I had never tried them before because they’re a little pricier than my usual store-brand yogurts, but, believe me, it’s worth the extra buck. The Strawberry Shortcake flavor was good, but the White Chocolate Cheesecake flavor was ah-mazing and lived up to its name of Smooth & Creamy. In fact, the yogurt was so rich that I didn’t even notice that a serving size was just 4 oz. With just 70 calories, it could easily be a decadent dessert that fools you into thinking you really splurged. I eat a lot of Fiber One products—cereal, the Oats and Chocolate bars, and the occasional toaster pastry (when I’m really craving a Pop Tart and need to feel not so bad for eating one)—but I had never tried the company’s yogurt. Which was dumb. I tried the Key Lime Pie variety and it was really, really good. Again, the serving size was a measly 4 oz., but they somehow worked the flavor of not only key lime but also graham-cracker crust into the yogurt, so I’ll forgive ’em. Amazing. Just amazing. 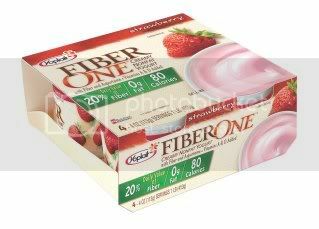 Plus at 80s cals, you get 5 grams of fiber per container! While I really, really liked the above yogurts, I may have saved the best for last. Fage 0% has almost a cult following in the healthy food blogging world, as this brand of Greek-strained yogurt is rich, creamy and full of protein with no fat. The plain versions of Fage are more like sour cream than plain yogurt, so they’re not for everyone, but I find them to be very savory with some honey or granola. Fage’s Total 2% with Cherry is no exception (although it does have a little fat in it), but it puts some sweet into the savory. The container comes with a large compartment filled with the yogurt and a small one filled with sweetened cherries. When you mix the two? It’s heaven. Savory cherry cheesecake tasting heaven. This yogurt is the most expensive of any I tried, but it’s a 130-calorie treat that is decadent, filling and good for you with 10 grams of protein and 10 percent of your calcium needs. Hey, if you’re going to splurge, might as well make it good for you if you can! 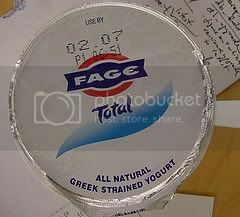 Fage photo grabbed from marstheinfomage on Flickr. I used to eat Fage non-fat with a little sweetener & blueberries or protein powder or cinnamon in there. Now I have found Trader Joes Greek non-fat yogurt & it is just as good & tastes great per the above things I do to it too. It has more protein than the Fage, minimal sugars & carbs.. Just love it!!!!!!! I like buying the non-fat plain & doing my own thing rather than getting the extra sugar and/or carb grams from added fruit. The Fage with honey is to die for as well! I usually get plain and add my own mixins- that way I can get 120 calories and 20 g of protein in 1 cup, which gives me enough caloric leeway to add my own fresh fruit and a drizzle of honey. I eat this with cereal for breakfast almost every morning. So good! I have never like yogurt but started to eat just plain non-fat yogurt and like to mix my own things in there. You know, blueberries, strawberries, apples with cinnamon, along with other stuff. So yummy. Even my 6 yr old enjoys it. He actually eats most of mine and his as well. 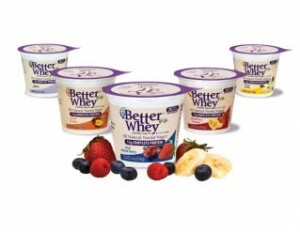 Thanks for reviewing Better Whey of Life Yogurt (and thanks for loving the name)! I’m the CEO and founder. I developed the product after dropping a skirt size when incorporating whey protein into my diet. It’s truly a wonder nutrient for all people! 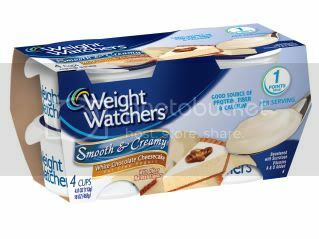 While I agree, several yogurts have lots to offer, we are different than Activia, Weight Watchers, and Fiber One because we are All Natural (while still providing probiotics and fiber). And, as for Greek Yogurts, while they are thick and creamy, they are strained. So, by nature, they can’t have any whey protein and fiber because it’s all strained out. That said, thanks for including Better Whey of Life among such prominent yogurts in the marketplace. We are honored to be a part of your review. And are thrilled that you liked them!!! THANK YOU!!! I hope you continue to enjoy Better Whey! But 2% does have some fat…4 grams per serving. Only the 0% have no fat. Daphne: Thanks for making an appearance on the blog! I eat Chobani Greek Yogurt. Today I had the honey…16grams of protein! 0% fat! I love the stuff! If you get a chance, also try the Oikos Organic Greek Yogurt. Also non-fat, but LOTS of protein! Comes in honey, vanilla, plain. Plain is good, the vanilla is very lightly sweetened and DELIGHTFUL! I love Fage yogurt. I have 1/2 cup daily with frozen mixed berries and 1/2 cup fiber one cereal. Well almost daily anyways… I also like Trader Joes Greek Yogurt 2% and if I don’t have the Fage, I have that one. I haven’t tried Whey of Life but am definitely planning on picking up some this weekend. Thanks to Twitter, I received samples of Chobani Greek yogurt and it’s delicious! Packed with protein and no fat. I throw in pomegranate seeds and a little bit of agave syrup as a pre or post workout snack. I’m also a big fan of Trader Joe’s non-fat Greek yogurt, it’s creamy and cost effective. this was really educational, my only problem is that i sometimes experience “yogurt burnout” after i eat it too often, but i use it in my smootihies. Since I have been researching the organic products on the market, I can’t wait to find the whey of life yogurt to try. That is really cool too, that she checks out your blog!! Can’t wait for the giveaway days…the simple thrills in life:) Keep up the great articles!! Thanks for this post! I haven’t tried any of these brands yet (but I have a brand-new small container of Fage in my fridge! Yay!). Like Laura, above, I didn’t really care for yogurt (except plain tart frozen yogurt, wow good) until I tried plain yogurt and added things to it. That’s what I eat most of the time, but Yo-Plus is actually really good too — very thick and creamy, which is what I prefer. I haven’t tried many flavors because I don’t see them often, but the strawberry is great.